Marlon Wayans is back and funnier than ever. 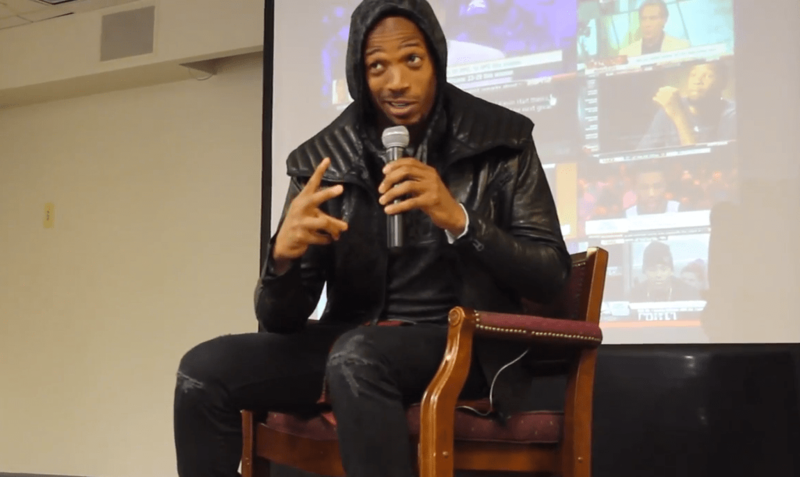 The star returned to his stomping grounds at Howard University to talk to students about motivation, life after college and his new film, “A Haunted House 2,” which opens this weekend. His visit was filled with laughter, serious moments and an Oscar-style selfie. 101 Magazine: What struggles did you go through to figure out your major, and what you wanted to do? Wayans: “I had no struggles. A lot of times, we make decisions based on fear. You have to dream. There is no falling back. There is no safety net with dreaming. 101: How do you suggest black artists gravitate toward mainstream media while staying grounded and true to themselves? Wayans: Label yourself as an artist. When you label yourself as a “black artist,” they’ll give you black business. No matter what, you are black. You’ll be surprised. The black experience is something that everyone understands. Appeal to the masses. 101: What was the transition like going from comedy to dramas? Wayans: I went to performing arts high school, and I love acting period. For me, comedy is harder; that’s why I choose comedy. You know what’s hard? Being funny. I have come off the top. There are a lot of great black actors, but a lot of black actors aren’t that funny. 101: How did Howard shape you as a man and your career? Wayans: Howard in a lot of ways was a blessing. It was a great experience. I learned how to navigate; it taught me how to be a man. I had to learn how to survive. You learn to hustle, and I made lifelong friends. I learned it’s not about the grades, but about who does the work. There are no excuses — do it. 101: What was the toughest brick wall in the process of reaching your goals? Wayans: It starts with speed bumps, to little hills, to huge mountains. The key is to use everything you learned before to get you over the mountain. Hollywood is the toughest. If you are not equipped to deal with challenges and look for pity, you shouldn’t go to Hollywood. Tonesha Townsel writes about arts and entertainment for 101Magazine.net. Gabriel Iglesias, left, portrays the neighbor of Marlon Wayans’ character, Malcolm. “A Haunted House” grossed more than $18 million during its opening weekend and more than $40 million worldwide after its January 2013 release. The sequel is expected to crack the sales of its predecessor, though the budget has not diverted far from the original.